While many people outside the New York area probably don’t think of it as much of a hiking destination, it has a lot more to offer than you might expect. Despite being the largest city in America, the landscape quickly gives way from the urban to the rural. There are also a large number of hiking clubs, due to the sheer size of the city’s population, which you can find using sites like Meetup.com – so there’s never a reason you’d need to hike alone if you don’t want to. Since many people in the area don’t own a vehicle, it’s a huge advantage that some of the best hiking trails along the Hudson River can easily be reached by public transportation. These are three of the best hiking destinations in the NYC area that are accessible by train. Breakneck Ridge, one of NYC’s most popular trails, is located 45 miles north of the city and can be reached in just over an hour and a half from Midtown on the Hudson Line. The train stops just half a mile from the trailhead at the Breakneck Ridge station (note that it only stops here on weekends). This trail is a loop, climbing 1,442 feet in the span of 3.7 miles – and it’s tough. From the train station, you’ll do a short, relatively flat section along Route 9 followed by a steep climb to up a to a ridge for the first views over the Hudson River. This first mile contains nearly all of the hike’s total elevation gain, and can require some scrambling with your hands and feet to advance up the mountain. The rest of the hike is much less challenging, and serves as a welcome relief from the first mile. It’s not the best hike for young children, dogs, or those who aren’t in good physical condition. If that first section is too exerting, white X’s mark an easier route up the mountain when the trail branches. You’ll want to budget at least four hours for this trail. While it is quite challenging, completing it will leave you with a sense of accomplishment and some fantastic photos. Views of the Hudson Valley from the summit are amazing, and Newsweek rated it as one of the ten best hikes in America. Breakneck Ridge sound like too much of a slog? The nearby Blue Mountain Reservation makes for a much more relaxing jaunt in the woods. It’s also about 45 miles north of the city or a little over an hour and half on the Hudson Line, near the Peekskill stop. If you do take the train, the trailhead is a half hour walk from the station. Blue Mountain can get busy with mountain bikers on the weekend, though the paths are wide enough to accommodate both hikers and bikers. Visit on a weekday if you’re looking for solitude, though. Despite it’s popularity, the reservation can be a little confusing with numerous unsigned trail intersections – it pays to bring a map along. For a comparatively easy hike, follow the Blue Mountain Summit Trail (blue blazes) from Lounsbury Pond for two miles to the summit. The first mile and half consists of gently rolling hills and only the last half-mile requires much of a climb. The namesake peak is just under 700 feet in elevation and is covered in trees, so views of the Hudson are obscured. For the best viewpoint, take the detour on the left side of the trail before the final ascent to the summit. As an added bonus to this trail, a quarter mile from the train station is the Peekskill Brewery; reward yourself for a hard day of hiking with a nice cold beer. This state park is a little further away than the other destinations on the list, but it’s an excellent place to take kids or anyone is who’s looking for a tranquil forest walk without any hill climbing. 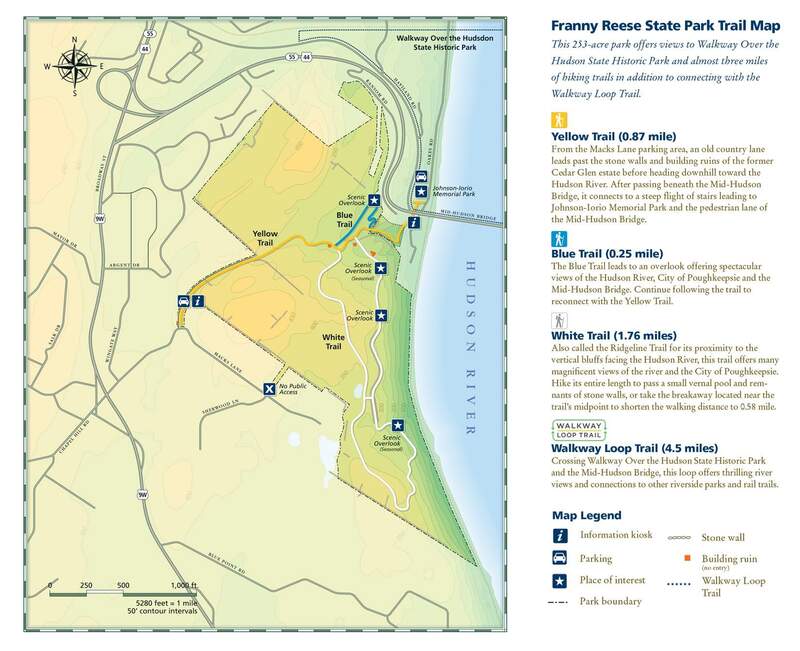 Located 90 miles from Midtown and a two-hour ride on the Hudson Line near Poughkeepsie, Franny Reese will impress any visitor with its countryside charm and laidback trails. One of the biggest highlights of this hike starts before you even reach the park: the Walkway Over the Hudson is the world’s longest pedestrian bridge, sitting over 200 feet above the Hudson River and providing 360-degree views of the beautiful waterway and its shores. From the Poughkeepsie station, it’s a mile and half walk over the bridge to the trailhead. Once you’re in the park, there are t﻿﻿wo main trails to choose from: the yellow trail and the white trail. The yellow trail is a two-mile out-and-back hike along an old carriage road that passes by the ruins of the historic Cedar Glens Mansion. The white trail is 1.75-mile loop that overlooks the river and the Mid-Hudson Bridge for much of its length. Both trails are suitable for hikers of any level. Despite being the most heavily urbanized region of the United States, the Hudson Valley, which runs from from Manhattan to Albany, has some pretty amazing hiking. Even the most devoted city dweller sometimes needs a break from the concrete jungle. Although Central Park can make a good escape, you can still see the skyline and hear the blaring of horns. To really get back to nature, you need to leave the city behind. Fortunately, hiking near NYC can be a great experience with some of the nation’s best hiking just a train ride away, and trails for every skill level are waiting.